One of the easiest ways to make your donation to Francisvale is through our online partner, Donor Perfect. Donor Perfect is an easy and secure way to give to your favorite organizations online. They will process your donation on their secure server and pass it on to us. Francisvale will not receive your credit card information or other sensitive data. You may designate how Francsivale Home is to use your gift, and you can give in honor or memory of a loved one if you’d like. You also have the option of making monthly recurring donations. Just visit our Donor Perfect page and select “Recurring Donation”. If you prefer to donate through mail, Francisvale also accepts checks. If you have any questions about paying via mail, give us a call at 610-688-1018. We would be happy to help you make a donation over the phone with your credit card. Please call the office at 610-688-1018 and a staff person will help you get started with making a donation. Francisvale Home for Smaller Animals is a 501 (c) 3 organization. 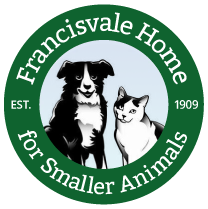 The official registration and financial information for Francisvale Home for Smaller Animals can be obtained from The Commonwealth of Pennsylvania Department of state by calling toll-free within the state of Pennsylvania, 1-800-732-0999. Registration does not imply endorsement.